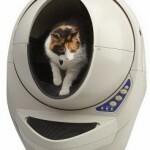 (3.0/5)ScoopFree Slide is the manual cleaning version of the Scoopfree automatic cat litter box. It works with disposable litter trays pre-filled with blue crystals to control odor and for easy cleaning. ScoopFree Slide is easy to use; just slide the waste with a rake into the waste trap to get clean litter every day. Once the litter tray has been used for a week or two remove it for convenient disposal and place a new clean litter tray. The Slide includes one disposable litter tray pre-filled with blue crystal. Easy manual cleaning system sliding the waste into the waste trap. Disposable trays have plastic lining to avoid leaking. 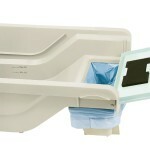 All ScoopFree disposable trays are suitable with Slide. 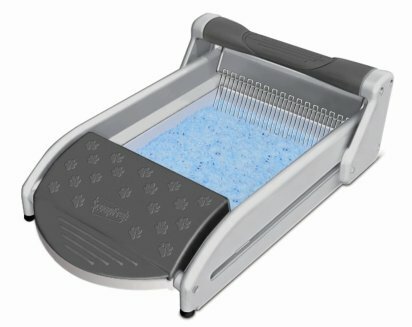 Scoopfree Slide’s concept is the same of Scoopfree automatic cat litter box; it uses disposable trays prefilled with blue crystals underneath the litter box and a rake that pushes the waste into a waste receptacle located on the disposable tray while the liquids go on the litter area of the tray. Unlike the automatic Scoopfree litter box, the Scoopfree Slide’s rake is moved manually in order to clean the litter box. The process is to step on the Scoopfree Slide’s waste trap lid which is connected with the disposable tray through magnets, then slide the rake handle slowly toward the front of the litter box to make the waste go into the tray waste area. Finally slide the rake handle toward the back of the litter box. Lower the waste trap lid. See the video how it works here. Trays with blue crystals will remain clean for weeks at a time. The manufacturer recommends replacing the litter tray at least once every 20 to 30 days with one cat; 10 to 15 days for 2 cats and 7 to 10 days for 3 cats. If the ScoopFree Slide is used with kittens younger than 6 months age you might notice that pre-filled trays experience shorter lifespan. 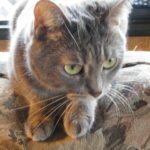 The same if you have an adult cat older than 10 years age or if your cat has digestive or urinary problems, with a diet high in crude fiber, ash or by-products. Consider these points before using the ScoopFree Slide. Trays have plastic line to avoid leaking. Build up of litter at both ends of the tray. The rake gets very dirty and has to be cleaned frequently. Walls are rather low so is easier for cats to throw litter outside if they are diggers. Waste container on the trays holds waste for one or two weeks. It is always a good idea to get a mat to place underneath the litter box. If your cat does not take to the crystals, you can try with regular litter. ScoopFree Slide has a simple concept of sliding a rake to get the waste into a disposable tray compartment for easy disposal after a couple of weeks. Though, in practice, it seems like this unit needs some design improvements as customers stated in reviews. The ScoopFree Slide is not as good as its automatic version, however, crystals are a good way to keep the ammonia odor from covering the house. 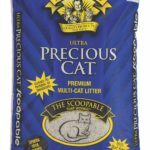 Because of the Pros and Cons and current customer’s reviews I would not consider the ScoopFree Slide Manual litter box as desirable as other manual self cleaning options, but if you like the idea of using blue crystals because they are good at containing ammonia smell from cat’s urine, I recommend you to try the automatic version of the Slide: the ScoopFree Automatic Cat Litter Box.